Sri Lanka regained the Asia Cup trophy with a comfortable five-wicket victory over defending champions Pakistan. Sri Lanka regained the Asia Cup trophy with a comfortable five-wicket victory over defending champions Pakistan, riding on Lasith Malinga’s five-wicket haul and opener Lahiru Thrimanne’s fluent century. Sri Lanka were clinical as they restricted Pakistan to a modest 260 for five and then overhauled the target with 22 balls to spare to lift their fifth Asia Cup title. The last time they won the regional championship was in 2008. Malinga pegged Pakistan back as he demolished the rival top order with his fierce pace and it was Fawad Alam’s magnificent unbeaten 114 that guided the holders to a decent total after deciding to bat. Pakistan skipper Misbah ul Haq (65) and Umar Akmal (59) too batted with determination with fighting half-centuries as none of other Lankan bowlers could take a wicket. Alam added 122 runs for the fourth wicket with Misbah and 115 with Akmal for the fifth at Shere Bangla stadium. The Island nation had started brilliantly but spinner Saeed Ajmal removed Kusla Perera (42) and Kumar Sangakkara (0) off successive balls in the 11th over to take the fight to the rival camp. However, Mahela Jayawardene (75) perfectly timed his return to form as he joined Thirimanne at the crease and added 156 runs for the third wicket in 27 overs. The partnership pushed Sri Lanka close to win. Thirimanne scored 101 runs, his third ODI century, and faced 108 balls in his innings which was laced with 13 fours. The left-handed batsman was bowled by Ajmal when Sri Lanka were just 14 runs away from the win. Bowling his final over, Ajmal beat the defense of Thirimanne with a ‘doosra’. For Jayawardene, it was his first notable contribution for Sri Lanka in this tournament and it could not have come at a better time. He was dropped on 52 by Mohammed Hafeez off Umar Gul but was dismissed when he attempted a big shot off Mohammad Talha and found Sharjeel Khan. His 75-run knock came off 93 balls with 10 boundaries including a six while Thrimanne. 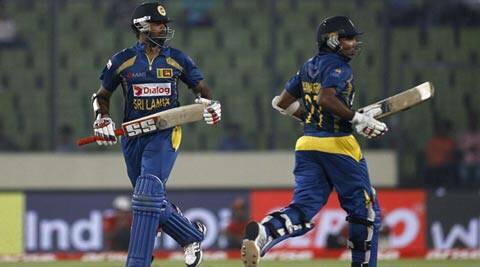 The Lankan openers, Thirimanne and Perera, ensured that gave them a decent start, putting on 56 runs in 10 overs. Ajmal briefly turned the match around for Pakistan when he had Perera stumped and trapped the in-form Sangakkara with a doosra in the next ball to bring on an out-of-form Jayawardene. The former Lankan captain, who had 36 runs from his last four innings, lived up to the team’s faith as he calmly went about the chase with Thirimanne playing the lead role. Luck too aided the Lankans when Thriminnne was dropped on 36 by wicketkeeper Akmal while Jaywardene’s appeal was turned down by umpire Bruce Oxenford in the same 20th over. For some strange reason, Pakistan’s main weapon in Ajmal was taken out of the attack after the 15th over in a seemingly defensive strategy, a move that did not work. Ajmal returned in 27th over but it was too late as by then Thirimanne had sprinted to 64 from 63 balls, while Jayawardene looked to have got his silken touch back having hit four boundaries and one six to be on 40 from 55 balls. From there on it was a match for Pakistan to lose and nothing went in their way — from a flurry of dropped catches to lack of sloppy fielding. Having completed his half-century with a boundary to Gul, Jayawardene top edged one but this time Hafeez slipped the skier. Earlier, Fawad Alam’s struck his maiden ODI century after Malinga made early inroads. Alam struck eight boundaries and three sixes en route to his first hundred from 29 matches. Alam mostly played in front of the wicket and ran between the wickets hard. Barring one reprieve he got when he was dropped on 92 by Chaturanga de Silva at midwicket, it was a chanceless innings from Alam, even as Malinga ran with a second five-for against them in the tournament. Alam cruised to the three-figure mark by pulling Thisara Perera for a six over midwicket. In Umar Akmal, he found a perfect partner and the duo added 115 runs for the fifth wicket, something that ensured Shahid Afridi (0 no) remained stranded without getting strike for a single ball in the final. First, it was the Lankans’ bold strategy to drop out mystery spinner Ajantha Mendis, perhaps in a move to counter Shahid Afridi’s belligerent form, that surprised many as they went with a batting combination in the most important match of the tournament. Malinga was back to get the new ball so was Sharjeel Khan after recovering from an injury as the Pakistan opener punched the Lankan pacer for two boundaries in the first over. But Malinga had the last laugh as the aggressive looking Sharjeel looking for a third boundary was caught brilliantly by a Perera at mid on. Malinga was on a roll taking a second and third wickets in his next two overs with the Pakistan’s top order of Sharjeel, Ahmed Shehzad and Mohammad Hafeez getting out for 8, 5 and 3 respectively. While Sharjeel threw his wicket away looking to step up the momentum, Shehzad and Hafeez perished to some genuine outswingers as Malinga put Sri Lanka on top in his first three overs. While Malinga was doing the damage, Lakmal impressed at the other end as he bowled with pace, and in the right areas to tighten the proceedings. Lakmal conceded just 10 runs from his first spell of five overs that included two maidens including one to Pakistani skipper Misbah who took utmost caution with his last three innings read an woeful 0, 1 and 4. Thankfully for Misbah, he found a perfect ally in lefthanded in form batsman Alam who looked impressive with his 74 in their last match against Bangladesh. Alam looked compact even with his wide open stance and never had any trouble as the left-hander smartly rotated the strikes with Misbah in Pakistan’s mission recovery.